I was recently reminded of claims that periodontal disease is associated with medical conditions like heart attacks, strokes, pre-term births, and diabetes. Yes, there is an association among those conditions, that’s true. However, some dentists and hygienists try to scare patients into treatment by claiming that gum disease actually causes those conditions. That’s simply not true! One of the most recent articles touching on this touchy subject was by Dr. Chris Kammer, titled “Your Gums are a Cesspool of Infection…and Most Dentists Don’t Care!” as a blog article for the American Academy for Oral Systemic Health; an organization that he coincidentally co-founded in 2010. The entire purpose of this organization, incidentally, is based on the idea that oral disease (primarily periodontal disease) has significant links to disease in the rest of the body. This link between the oral cavity and the rest of the body was first hypothesized and published in 1989 in two Scandinavian reports (Mattila et al in the BMJ, and Syrjanen et al in the J. Inter. Med) and studies continue to this day. To this day, however, the results are simply not strong enough to make claims about causality. Just as I’ve criticized holistic and alternative medicine and dentistry as junk, it’s crucial that dentists be honest about the level of evidence for anything that we recommend – even flossing! When we see things that seem to be connected, like gum disease seems to be connected with heart attacks and strokes, we have to ask: is it correlation (coincidental), or is it actually causal (one thing directly leads to the other). Yes, there seems to be a strong correlation between gum disease and heart attacks and strokes, even after accounting for other common risk factors like smoking, age, etc. At some point, we may find that gum disease genuinely contributes to, or worsens, cardiovascular disease, but even that study isn’t “proof.” Not yet. A reminder: if you look hard enough, you can find correlations between the most remarkable things, as you can see at Spurious Correlations. Check out these hilarious 2 examples! 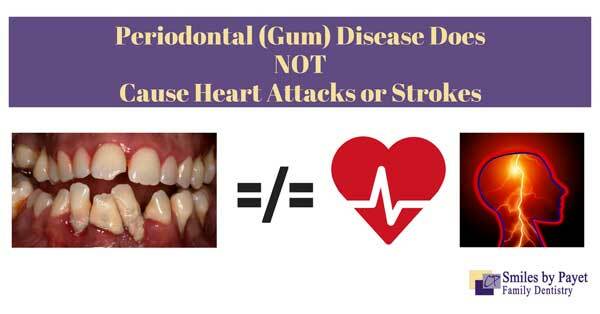 Are Gum Disease & Heart Attacks Really Linked? Before we even address the connection between oral infection and overall body health, let’s talk about how prevalent gum disease is in the US population. Referencing again the article by Dr. Kammer, he lists a few scary-sounding facts. Receding gums are a sign of gum disease. Gingivitis = inflammation (which includes bleeding easily when irritated). Gingivitis is usually caused by aerobic bacteria, which means they need direct oxygen exposure to grow and the physical irritation caused by plaque build-up around the teeth. Periodontitis is associated with more virulent, powerful anaerobic bacteria , meaning they don’t need direct oxygen exposure to grow. Here’s how I describe the difference to my patients to make it understandable. “Gingivitis is similar to what happens if you get a paper cut; it gets red, irritated, sore, and bleeds easily if you rub it, which is similar to the bleeding you see with gingivitis during brushing or flossing. But if you put some ointment and a band-aid on the paper cut, it quickly heals, just as gingivitis will go away quickly with more regular brushing and flossing and a good cleaning by a dental professional. The big difference between periodontal disease and an severely infected cut, though, is that it’s impossible for us to completely rid the mouth of the bacteria that cause the infection, even with antibiotics. Periodontal disease can not be cured, not even with LANAP. That’s why it’s important to keep it under control with more frequent dental checkups called “periodontal maintenance” visits. Other steps that can help include using a mouthrinse containing chlorhexidine, an effective antibacterial. Electric toothbrushes have been shown to be more effective than manual brushes, especially for patients with disabilities that limit hand dexterity. Water picks and interdental brushes are also helpful for getting in between teeth and into areas where bacteria are hard to reach. How Does This Alleged Connection Work? The chronic inflammation caused by oral disease spreads through the body, increasing the levels of C-reactive proteins, free radicals, etc. This chronic inflammation damages internal organs and blood vessels to varying degrees, and the long-term effects increase the risk of diabetes, blood clots, strokes, etc. The bacteria generally associated with gum disease have been found in organs, such as the heart, in individuals suffering from coronary artery disease, high blood pressure, coronary stenosis, strokes, etc. Just because they’ve been found there, however, doesn’t necessarily mean they caused the problems, just that they are found in the same place. They’re associated with each other, but we don’t know if one caused the other. To be fair, it is true that chronic inflammation is not healthy and probably does damage other parts of the body. The same is true for the periodontal bacteria that spread through the body. The problem is that we can’t yet quantify just how not healthy these are and how much damage they do. Scientific Statement by the American Heart Association in 2012: Periodontal Disease and Atherosclerotic Vascular Disease: Does the Evidence Support an Independent Association? If those aren’t good enough reasons for you to get your periodontal disease treated, then nothing else I tell you will make a difference. Telling you that it might lead to an increased risk of heart attacks or strokes sure won’t. Is Gum Disease Under- or Over-Diagnosed? This only reported on insurance claims but ignored all the people without insurance. That means that a LOT of appointments for dental treatment were ignored. That means the numbers are really skewed. Of the people who actually go to the dentist on a regular basis (about 50% of the US adult population), many of them are healthier exactly because they go regularly. However, it’s also fair to say that many dentists don’t diagnose or treat periodontitis. Not in our office though. We take gum disease very seriously; we don’t want you carrying a chronic infection in your mouth that will get worse. Check our page on LANAP, or Laser Periodontal TherapyTM, for information about both Scaling and Root Planing (non-surgical therapy) and LANAP itself. We LOVE doing LANAP for our patients with moderate-to-severe periodontal disease; it’s remarkably comfortable and amazingly effective. ** For additional reading, I highly suggest Gum Disease Doesn’t Cause Heart Disease by my colleague and fellow blogger Dr. Alan Mead.